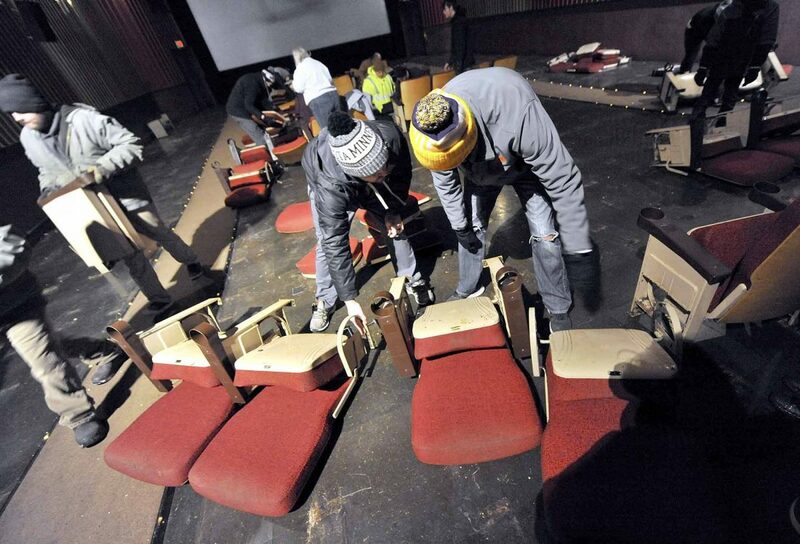 Rick Dyer, of Humboldt, at left, along with his friend Kim Olson, also of Humboldt, work on removing the 18 theater seats they picked up at the Humota Theater in downtown Humboldt Saturday morning. Mike Mericle, of Fort Dodge, at left, along with his friend, Radney Roosa, of Badger, work on taking apart a set of theater seats Saturday morning at the Humota Theatre in downtown Humboldt. 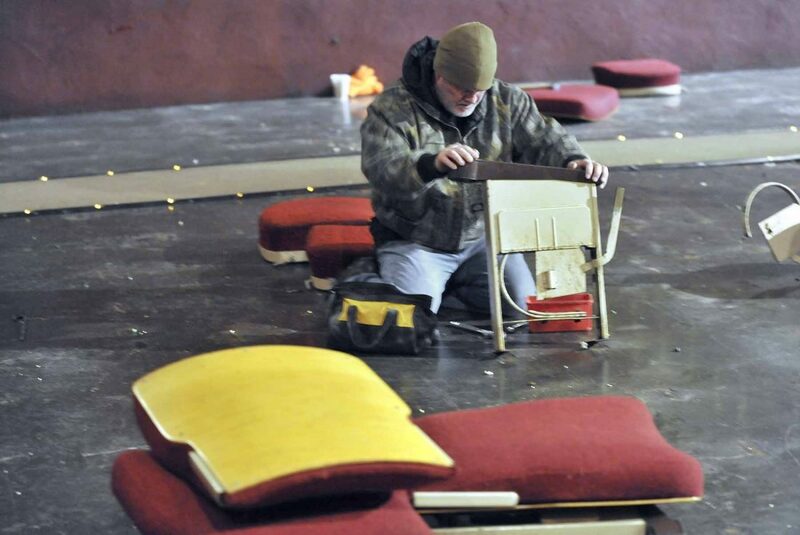 Kip Ireland, of Humboldt, works on getting a seat support loose from the floor Saturday morning inside the Humota Theatre in downtown Humboldt. 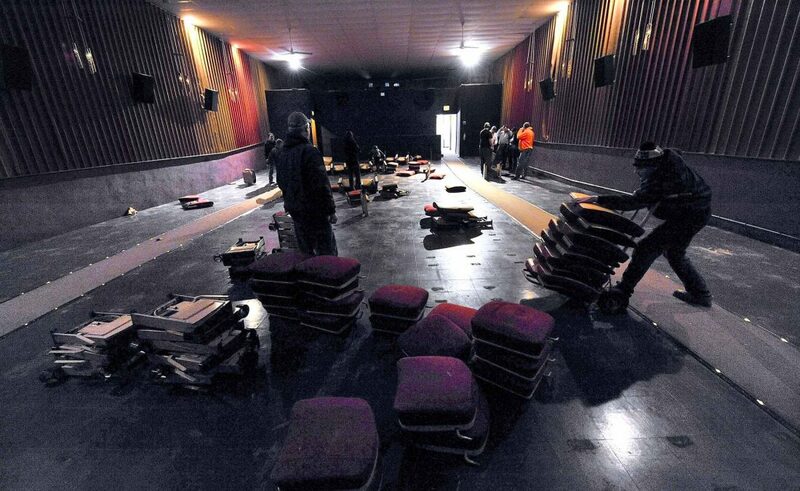 -Messenger photo by Hans Madsen Those who came to collect the theater seats at the Humota Theatre in downtown Humboldt made quick work of it. 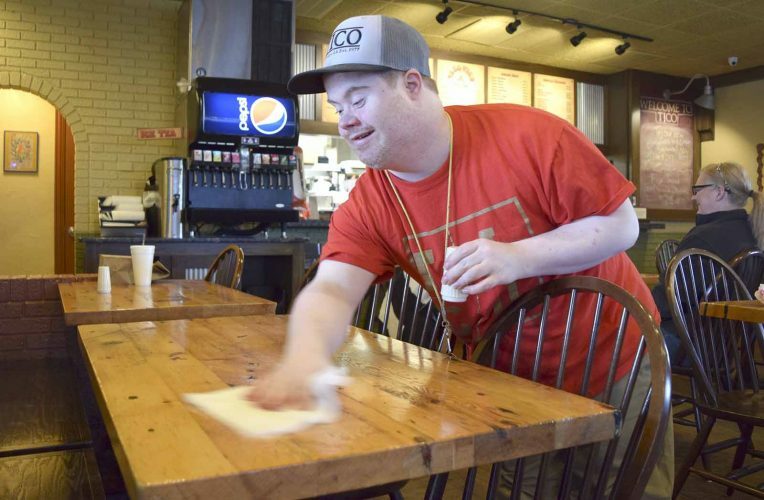 It took them about an hour to remove them all which gave steering committee liason Andy Milan an opportunity to sweep the floor. 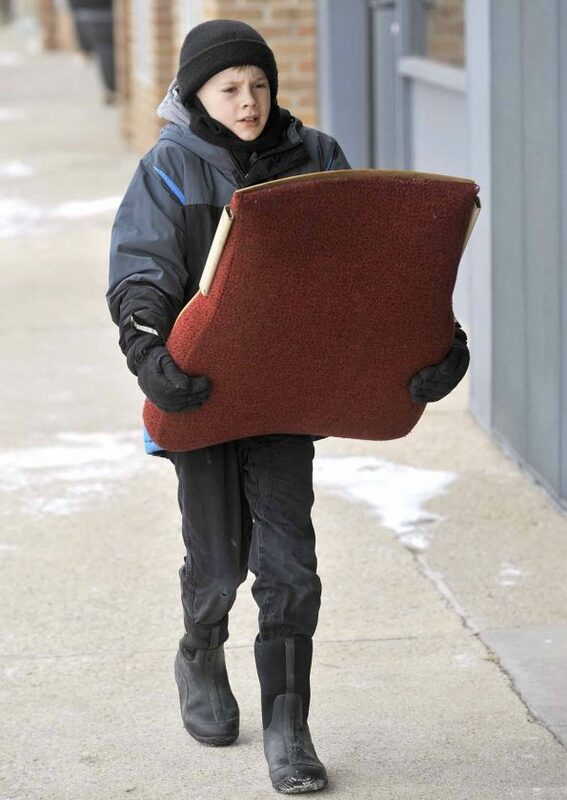 Emmett Schmidt, 9, of St. Joseph, carries a section of theater seat down the sidewalk Saturday morning as he helped a family friend load them into their vehicle. 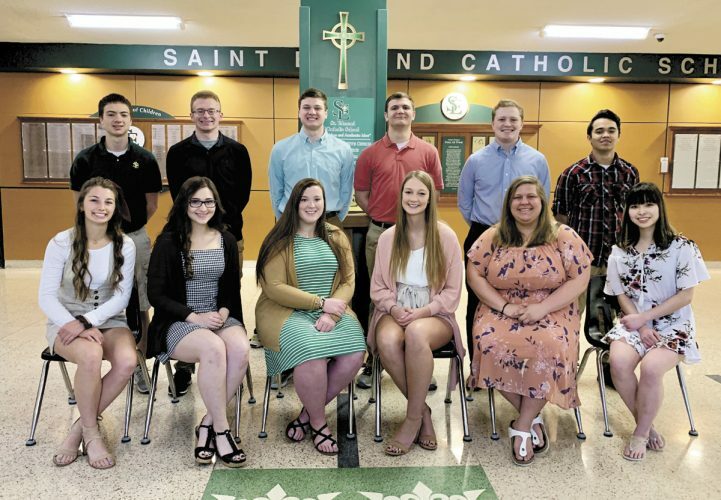 HUMBOLDT — The phrase “come on in and have a seat” was taken literally Saturday at the Humota Theatre in Humboldt when the public was invited to come in and, well, take the seats. The doors opened at 10 a.m. In about an hour the seats were gone. The theater seat giveaway took place to make way for new seats which have been donated. 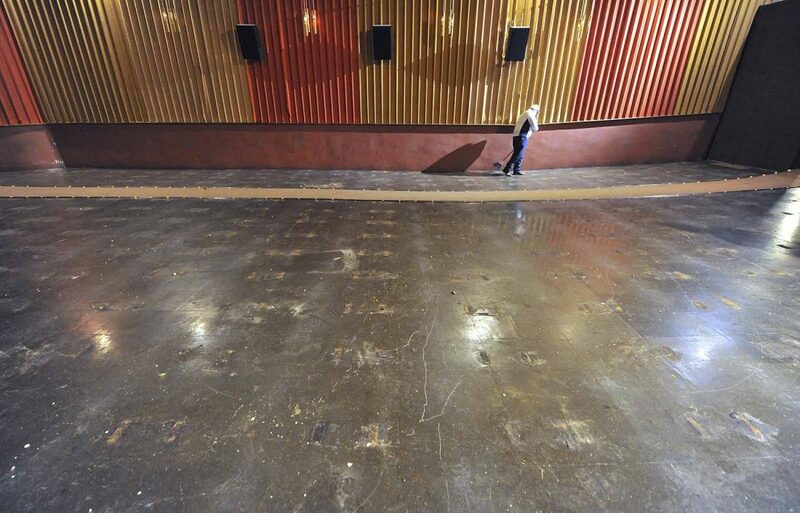 The theater was recently sold by former owner Brian Fridley to the city. A 501(c)3 was set up to operate it as a nonprofit. 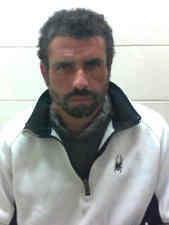 Andy Milan, of Humboldt, is the liaison for the Humota Movie Group steering committee. An anonymous donor stepped up and gave them about 350 seats to install, which left the question of what to do with the old ones best answered by: let the public have them. Radney Roosa, of Badger, and his friend Mike Mericle, of Fort Dodge, came by and claimed a row of four each. One set was going to end up in Roosa’s basement, the other in Mericle’s man cave. They found the seats in good condition. “Cleaned up they’ll be nice,” Mericle said. The row of four they were working to take apart for transport were surprisingly free of what one might expect the underside of a theater seat to be encrusted with: old chewing gum. There was one small piece on the four. 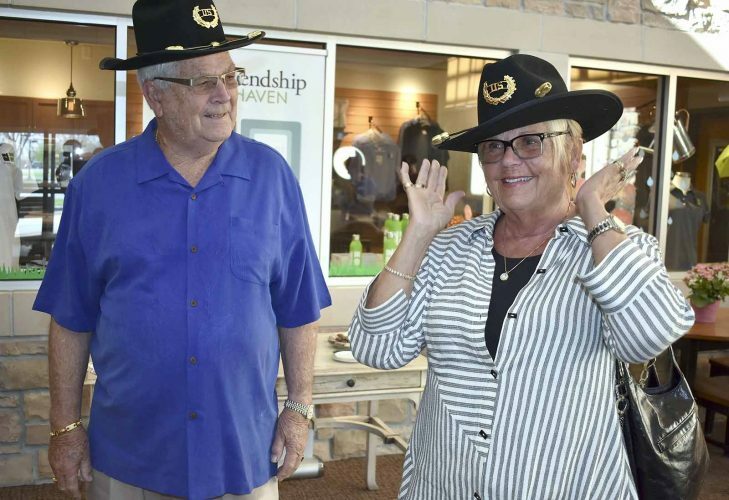 “That’s the first one I’ve seen,” Mericle said. Rick Dyer and his friend, Kim Olson, both of Humboldt, were taking 18 seats home. The 18 seats were destined for Dyer’s siblings. Treasure was discovered near the row the pair was taking apart. “I found a quarter, but I can’t get it off the floor,” Dyer said. Olson tried picking it up too. Kip Ireland, of Humboldt, was picking up a few of the seats for a relative, too. He was pretty sure none of the gum was his though. He has fond memories of taking his children to movies at the Humota. The stuck quarter on the floor, though, he might have been indirectly involved in that. He, too, thought the seats were well taken care of and in pretty good condition.